Woven strap bracelet with a semi-precious turquoise tactile pebble button fastener. Butterfly gold plate (4.5cm/45mm). Woven bracelet with silver plated beads and shades of green cord. 1.2cm/12mm wide and 17cm/117mm long. Woven strap bracelet with a semi-precious blue pebble button fastener. Butterfly silver plate (4.5cm/45mm). Woven bracelet with silver plated beads and shades of blue cord. 1.2cm/12mm wide and 17cm/117mm long. Beautiful beaded stretch type bracelet. A stunning slection of beads: glass, paste, crystal, turquoise, wood. 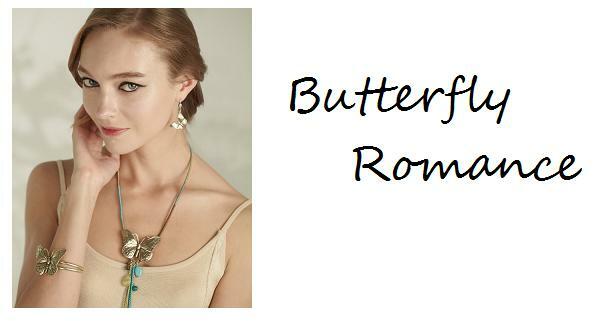 Largest butterfly gold plate (4.5cm/45mm) flanked by a silver plated flower and smaller butterfly. Beads measure 5mm upto 2cm/20mm. Unstretched inner circumference 16cm/6.5 inches. Beautiful beaded stretch type bracelet. A stunning slection of beads: glass, porcelain, crystal. Largest butterfly (4.5cm/45mm). Beads measure 5mm upto 2cm/20mm. Unstretched inner circumference 16cm/6.5 inches. Silver plate. A longer length necklace featuring various glass, wood, crystal and semi-precious stones. Beautiful details, the butterflies measure 4.5 cm/45mm 2.8cm/28mm. Length of the pendant is approx. 17cm/170mm. Length of the necklace is 24 inches/61 cm to an adjustable 27 inches/68.5cm. Burnished gold & silver plate/Shades of turquoise and green. A longer length necklace featuring various glass, crystal, porcelain and semi-precious stones. Beautiful details, the butterflies measure 4.5 cm/45mm 2.8cm/28mm. Length of the pendant is approx. 17cm/170mm. Length of the necklace is 24 inches/61 cm to an adjustable 27 inches/68.5cm. Burnished silver plate/Shades of blue. 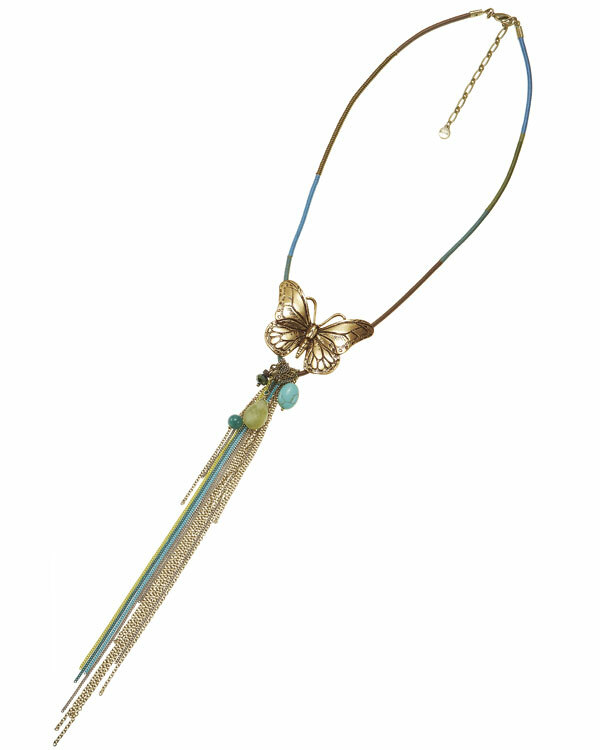 A mid-length necklace featuring a larger butterfly (gold plate/6cm/60mm) and a cascade of mixed metal chains with various glass, crystal, wood and semi-precious stones. Length of the pendant is approx. 11 inches/28cm. 7cm/170mm. Beautifully bound cord in mixed colours (brown, olive, turquoise). Length of the necklace is 21 inches/53.5 cm to an adjustable 24 inches/61cm. Burnished silver plate/gold plate. Shades of turquoise and greens. 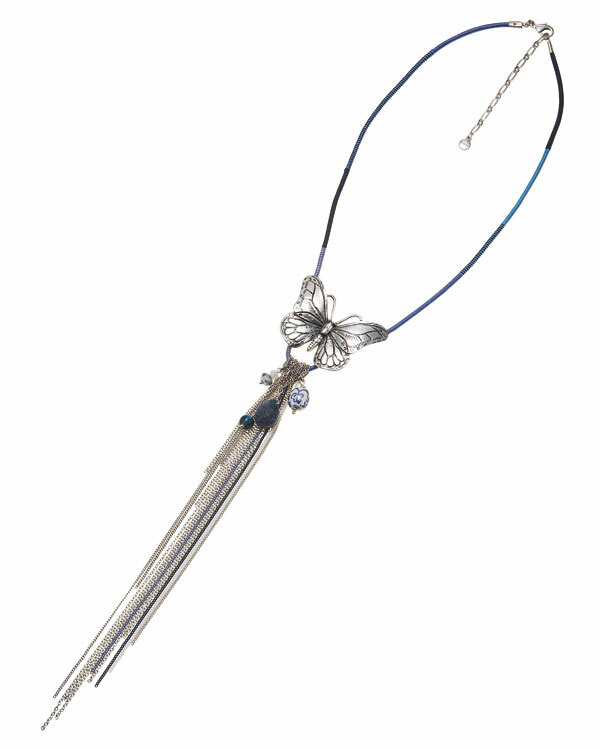 A mid-length necklace featuring a larger butterfly (silver plate/6cm/60mm) and a cascade of mixed silver and blue toned metal chains with various glass, crystal, porcelain and semi-precious stones. Length of the pendant is approx. 11 inches/28cm. 7cm/170mm. Beautifully bound cord in mixed blues. Length of the necklace is 21 inches/53.5 cm to an adjustable 24 inches/61cm. Burnished silver plate plate. Shades of blue. Bead drop earrings featuring tactile rounds of turquoise and edgy faceted crystals. Mixed gold and silver plates. Total length 4.5cm/45mm. French clasp for pierced ears. Bead drop earrings featuring tactile porcelain rounds of white and blue and edgy faceted crystals. Silver plate. Total length 4.5cm/45mm. French clasp for pierced ears.